Shaykh Hasanali was born in 1279/1862 into a pious, God-fearing family, who were interested in religious learning. Both his father Akberali, and grandfather Rajabali Miqdadi Isfahani, were eminent scholars and gnostics in their own right. His father had a unique practice of using exactly half his income for his family’s needs, and distributing the other half to the poor amongst the descendents of Lady Fatima Zahra (A). Under the careful care of his father, Shaykh Hasanali began to receive religious and spiritual training from a very young age. The Shaykh narrates: “I remember being only 8 years old when my father first took me to visit his own spiritual instructor, the great arif, Haj Muhammad Sadiq (RA). It was the time nearing sunset in the month of Ramadhan. Somebody presented a gift of nabaat (rock candy) to Haj Muhammad. He returned most of it with thanks, but he had a small piece in his hand which he gave to me and said, “Eat”. I ate it immediately. My father informed him that I was fasting. From this moment Shaykh Hasanali began to receive the special attention of Haj Muhammad, who guided him into the secrets of salaat, fasting and other acts of worship. In fact, that great soul always stayed in touch with him and guided him whenever necessary. Shaykh Hasanali used to say: “Whenever I needed guidance or instruction, I would receive instructions from the soul of this great arif in a dream at night. And his guidance would immediately solve my difficulty. I remember clearly that after his death, another teacher was very insistent that I should seek out a living master and guide (for the wayfaring path). That night I saw Haj Muhammad in a dream. He grasped my shoulder and stated, “Whoever drinks from the fountain of life in the manner that I drank from it, shall never die. Where (else) do you wish to go?” « ولا تحسبنّ الذین قتلوا فی سبیل الله امواتاً بل احیاء عند ربهّم یرزقون ». The lasting effect of his childhood training by this great teacher was evident in the conduct and habits of Shaykh Hasanali. From the age of 15 till the end of his blessed life, Shaykh Hasanali always fasted the three months of Rajab, Sha’ban and Ramadan, and never slept in the night and only rested after sunrise. Shaykh Hasanali embarked on the study of the Islamic sciences from an early age. He studied usul, fiqh, Arabic, exegesis, philosophy and logic under the best teachers in Isfahan. 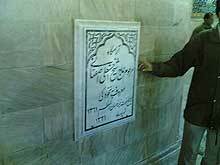 He studied fiqh and philosophy under Akhund Mulla Muhammad Kashi and tafsir under Haj Sayyid Muhammad Fishariki and Haj Sayyid Murtaza Kashmiri. After finishing his preliminary studies under these illustrious teachers, Shaykh Hasanali came to Najaf to benefit from the great masters who lived and taught at the feet of Amir al-Mu’mineen (A). Afterwards, he proceeded to Mashad where he completed his studies with the eminent teachers of his day, such as Haj Muhammad Ali Fadhil, Agha Mir Sayyid Ali Hairi Yazdi, Agha Husein Qummi and Agha Sayyid Abdul Rahman Mudarris. At the same time he continued with his rigorous personal spiritual practices and exercises. In matters of spiritual instruction, in addition to studying under Haj Muhammad Sadiq, he also benefited from the teaching of Agha Sayyid Ja’far Huseini Qazvini of Isfahan. He studied the “Qanun” (which is Ibn Sina’s most important work, a medical text comprising five volumes) under the medical practitioner, Dr Haj Mirza Ja’far Tabib in Isfahan. Shaykh Hasanali says, “In the mornings I would work at the doctor’s surgery, writing prescriptions and treating some of the ill patients, In the afternoons, I would study under him Ibn Sina’s Qanun. Haj Mirza Ja’far’s practice was that he would not demand a set fee for his services. Each patient would pay what they could afford, and if they did not have anything, he would not press them to pay. In this manner, despite being a doctor, his income did not exceed 8 or 9 riyals a day. I remember one day, he came to work and prayed, “O God, I have a guests for dinner tonight, command your angels to make arrangements for my guests.” That day, his income was 35 riyals. However, the rest of the days his income did not exceed 9 riyals, and he never complained, or prayed for any more. In 1319, Shaykh Hasanali went for Haj. He travelled by ship to Jeddah, then on foot to Madina. After paying his respects to the Prophet (A), Lady Fatima (A) and the Imams (A), he put on Ihram at Masjid-er Shajarah and proceeded to Makka on foot for the Haj. He lived for some years in Najaf and Isfahan, but in the year 1329/1911 he moved permanently to Mashad. At the beginning of the night, after completing his obligatory prayers, my father would busy himself in replying the queries and letters that he had received. Thereafter he would engage in study for some time. From midnight to sunrise, he would be occupied in prayers and worship. After sunrise, he would take some rest. Then, until midday, he would meet with people and prepare and dispense medicines for the ill. Finally, in the afternoon, he would proceed to the Madressa, where he held his classes. In the evenings he would make himself available to answer questions and help the needy with their problems. This remained his normal routine through the years, whatever the season and whatever his situation. He would only rest for a while after sunrise or briefly in the early afternoon. When he was in Isfahan, every year he would retire for forty days to the Zafra Mountains, where he would engage in constant contemplation, self purification and worship. He was very insistent that prayers should be prayed exactly on time, and would counsel us to remain awake a part of the night and engage in supererogatory worship. He would tell us to stay up all Thursday night and fast on the Ayam al-Baydh (the “white” days – 13th, 14th and 15th nights when the moon is full). He would encourage us to serve the people, especially the descendants of the Prophet (S), and to visit the graves of the Imams (A) and the saints, especially on Friday. Firstly: Always pray you daily prayers exactly on time. Second: Work as hard as you can to help and meet the needs of the people. Do not be hesitant to take on what appears to be a difficult task, because when a man takes one step on the path of God, then God’s help always follows. Third: Respect and look after the needs of the descendants of the Prophet (S) and spend whatever you have to make their lives more comfortable. Never ignore the plight of the poor and destitute. In this manner, even if you have less, at least you are not accountable. Fourth: Do not be negligent about observing the tahajjud and night prayers, and make taqwa the pivot of all your actions. Fifth: Study the religion to a level that you become free of the need to follow another scholar (taqlid). Just as he had predicted, Shaykh Hasanali passed away on Sunday, 17 Sha’ban 1361 AH. News of the death of this great scholar spread quickly and thousands of mourners attended his funeral. His body was laid to rest in the old courtyard of the shrine of Imam Ridha (A), at the same spot which he had indicated in his lifetime.